Unfortunately the sensors are no more available here than they are there, and people are waiting for the GM dealers to get parts so that their recall work can be completed. My assumption about your "new" sensor is that it was bad when you got it, or failed when you sat on it. It would be great if there was another car near you that you could use to test the sensor. I do not know what shipping of the sensor would be to the USA, but I would be happy to test your sensor in my car. I looked at airbag24 and did not see anything that looked like it would help in this case. They offered (for Opel GT) repair/replacement of the impact sensor and a bypass for an airbag or seat belt tensioner, but I did not see anything for the PPS. Of course I don't read German, and the translation is not absolute. Can you point me to their PPS replacement product? As I posted, my (single-point) experience has been that the B0081 71 DTC will reset itself at the next power-up after a working sensor is installed, so no external reset should be required. I am anxious to see the result from your Airbag360 device. FYI: To use the @ to get someone's attention it has to be continuous with the name. You put a gap between it and my name, so I did not get a notification. It is a disappointment that the PPS is not available in the USA at the moment. I did not know this. Also a German Opel GT forum refers to this. By the way, I have not received the airbag360 emulator today. Perhaps tomorrow. Indeed a good idea to try out a complete passenger seat (with correctly working PPS) in my Opel GT. I only have to find someone who wants to cooperate. The dealer where I bought the Opel GT has several GT's in maintenance. Perhaps there are possibilities (or else I just drive past you ). And furthermore I will contact the people of Airbag24 in Berlin (Germany) tomorrow and ask them about the possibilities. It is always good to have an alternative if the Airbag360 emulator does not arrive at all or if it turns out its not working. That's actually an interesting solution. Do you know of anyone who have tried it and can confirm that it works? That part is the SDM, so they must have a way to program it to ignore the PPS. I will be very interested in what they tell you. And, I did finally find the reference to being able to solve the PPS problem on their page. Unfortunately, I did not manage to call the people from Airbag24 today. Maybe tomorrow. I did receive the airbag360 emulator today. Try this weekend to see if it works (I do not expect much). I will see if I can find more reviews. It would actually be much nicer if reprogramming the SDM can be done via the OBD2 port. In that case, the SDM can remain in the car. Last edited by OmegaUser; 11-11-2018 at 03:41 PM. This brings up an interesting topic...I wonder what GM is going to do now that they are out of back stock of the PPS assemblies? I don't think IEE is producing them anymore. If they have to restart production that can't be cheap. IEE should still have the tooling and equipment to make these, since they are not yet 10 years out of production. Our contracts with the OEMs require that we be able to supply service parts for 10 years after the end of production. I am assuming that they treat all safety equipment the same. The delay should either be IEE tooling back up or GM certifying something different. Should being the operable word in both cases. I suppose they could be dragging their feet hoping we will all go away, but I don't really think so. Today I first erased the fault memory and then installed the airbag360 emulator. Immediately after switching on the ignition, the error message came back. I have found some more good airbag24 reviews about the programming of the PPS sensor and the safety belt warning light from the SDM. One of them was a recent one and was an Opel GT Roadster. 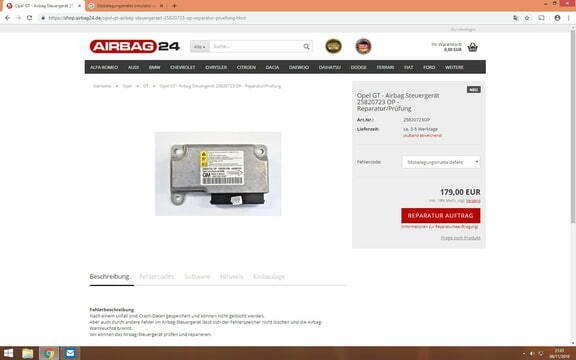 Because everything points to a broken PPS sensor, I decided that I have the modification by airbag24 but I have still some questions for them. Unfortunately, the company was closed on Friday afternoon. That will be next Monday. 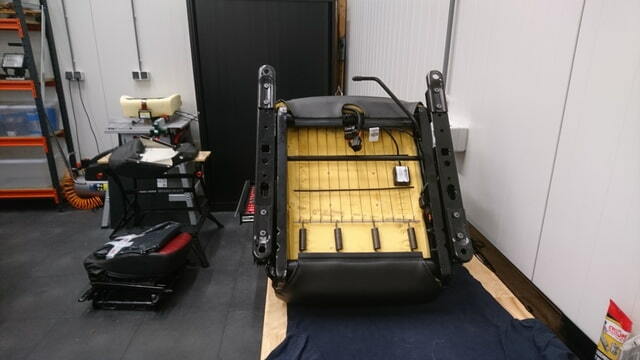 I have already removed the seats from the car and the relevant interior parts to remove the SDM. Does anyone know the tightening torque of the three nuts with which the SDM is attached to the body? I can not find anything about this in the workshop manual. Certainly bad news for/about Airbag360. They are now 0 for 2 with Opel GTs. I would still like to see one tested in a car with a working system, and see a known working PPS in your car. Bring it to my house and we will do some testing next to mine! My service manual specifies 10 N-m torque for the SDM nuts. > Do not strike or jolt the SDM. > Do not power the SDM unless it is securely fastened to the car with the arrow facing forward. > Failure to follow correct procedures could result in SIR deployment. Last edited by JohnWR; 11-10-2018 at 01:36 PM. Good information about the SDM, it's supposed to activate the airbags through a big capacitor even if the power is cut. I guess turning it around equals a rollover which should deploy the bags. Caution ! We have worked on a possible solution to fix the broken PPS, I'll get back to that during this week. I got the SDM from my Opel GT tonight (and I'm still alive ). Tomorrow I will contact Airbag24 and send them the SDM for the modification. 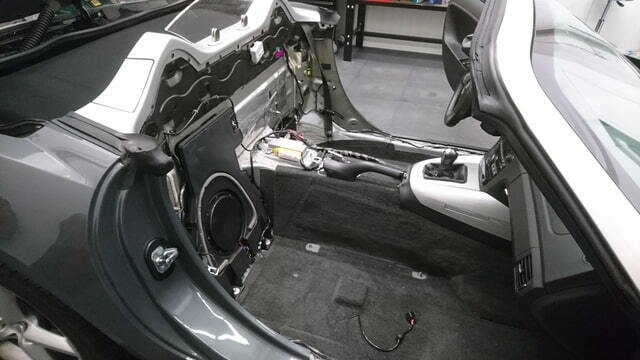 I have had contact today with a German Opel GT driver who has carried out the modification by Airbag24. He is very satisfied with the result. Hopefully I'll be that later too. @Kjelle69 Actually it should be done like you do; repair the sensor. Unfortunately in Germany they have no good experience with it, but maybe you will succeed. I am very curious about the result and in that case how you did it. Yesterday I have sent the emulator back to Airbag360 in Ireland and they promised to refund me the amount. Just wait and see. Last edited by OmegaUser; 11-11-2018 at 05:03 PM. Hello @OmegaUser how did it end with the re-programming of the sdm? Hello @Kjelle69 The story is not finished yet. Actually, the end has yet to begin. 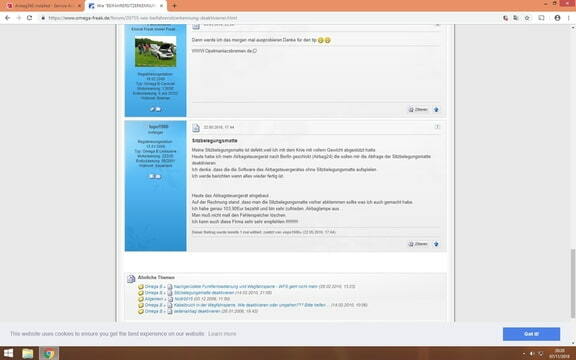 On 16 November I sent the SDM to Airbag24 in Berlin (Germany). Unfortunately, they were lagging behind with the processing of the orders. On November 23, I was informed that they had programmed the PPS and safety belt warning light out off the SDM. They tested the SDM and according to them the change was successful. They also tested the SDM and it worked properly. I paid 179 euro and the SDM went on transport to Alphen aan den Rijn in Holland again. I expect to receive it at the end of this week so I can put it back in the Opel GT. I am curious if the fault message "Service Airbag" and the airbag warning light are now off. I'll let you know. Have you been busy recovering the PPS in the meantime and has this been successful? In the meantime I have got back my money from Airbag360 for the non-working airbag emulator. Last edited by OmegaUser; 11-27-2018 at 04:06 PM. I have tried with one conductive glue called Enson, Chinese product. However, this did not work as the resistance was way too high. It looks promising but I have not had time to try it yet. I will tell you as soon as I have made the experiment.